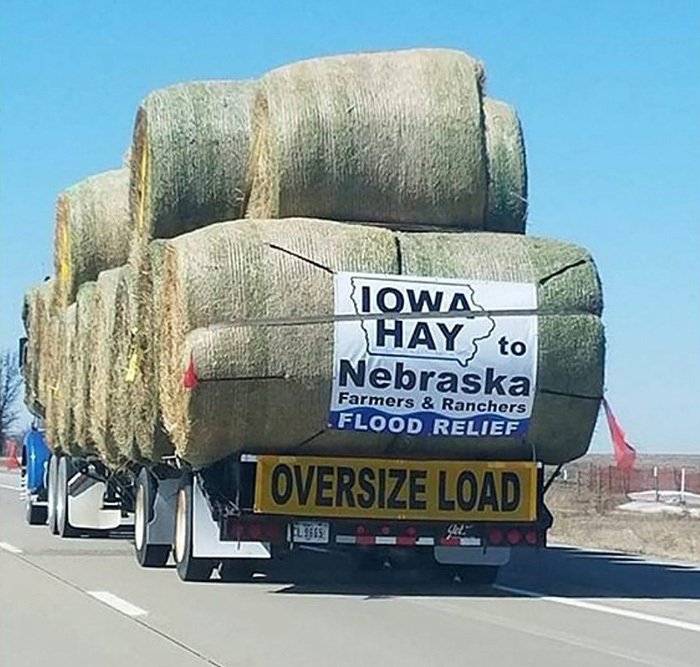 Iowa farmers have united to bring aid to flooded communities in Nebraska. Images of the flooding led Iowa farmers Robert Broulik and James Garnant to take action. "It's tough to see them people in that kind of shape," Garnant told Fox28. After a few phone calls to other local farmers, an oversize-load semitruck loaded with 75 bales of hay is on its way to Columbus, Nebraska. Others in the community donated money for fuel and supplies. "When you have livestock and things go wrong, I can only imagine having to feed them after you've saved them. Somebody's gotta help. So that's what we're gonna do," Broulik said.